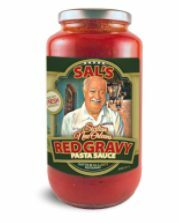 Sal & Judy’s™ Red Gravy is Chef Sal Impastato’s signature sauce. Sweet Italian plum tomatoes, fresh ingredients and a little pork are slow cooked to perfection in this classic, Sicilian/New Orleans Red Gravy. You can buy it here at Acquistapace’s in Covington and pick up a bottle of your favorite red for an Italian night in!